Laserfiche has been included in the shortlist of potential winners for the 2019 Family Wealth Report Awards, a program that recognizes top class performance and innovation in the wealth management industry. 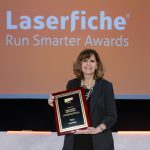 Individuals and organizations will be awarded in a number of categories; Laserfiche is a finalist in both the Compliance and New Account Onboarding categories. As the global leader for powering enterprise digital transformation, Laserfiche offers powerful solutions for the wealth management industry, including a new account opening platform. The intuitive solution automates the new account opening process, reducing processing time, eliminating manual data input and ensuring information accuracy by integrating multiple systems via a single interface. By digitizing and automating a traditionally paper-heavy, manual process, advisors create a seamless experience for themselves and their clients, and can spend more time on what really matters: serving their clients and growing their firm. Judging will be conducted by an expert panel drawn by both private banks and trusted advisors/consultants to the sector. Award winners will be announced March 20, 2019. For more information about Laserfiche for the wealth management industry, click here.